A Test Match that resulted in a draw also resulted in much discussion in newspaper columns, clubs, pubs and online media. I wrote my views on the match here. There have been a few articles subsequent to that including an excellent post by @sidvee, one by Minal, one by Sunny Mishra, a detailed analysis by “A Cricketing View” and a more recent one by Subhash Jayaraman. There have been many other blog posts by fans like me. The above list — which is by no means comprehensive — is a mere sample of the many blogs that have carried an article or two on the draw. I was fascinated by the use of the phrase “keyboard warrior”. The implication here is that “over-the-top criticism” necessarily emanates from “Keyboard Warriors”. Apart from “keyboard warriors” being a fascinating turn of phrase, its use got me thinking about the very essence, method, practice and sensiblities of critiquing criticism! But first things first: What distinguishes the views of the “Keyboard Warriors” from the rest of view-peddler merchants? In my view, players are the only tribe that are not “keyboard warriors”! Everyone else has a view and they qualify as a prospective “keyboard warrior”. The only people who are exempt from the warrior tribe are non-players who merely “call” the game without a single opinion being stated or a single view being expressed. My view is that there are very few view-less and opinion-free warriors these days. Everyone has a view. Hence, everyone qualifies as a keyboard warrior unless we wish to define a tribe called “Keyboard Saints”, who offer criticism and views that are distinct and differentiated from the “Keyboard Warrior” clan. Perhaps the use of the qualifier “over-the-top” in Dileep Premachadran’s implied definition is precisely that differentiation that we seek between the “Warriors” and the “Saints”. However, who decides if it is over-the-top? And what is then, under-the-top or even just-on-top? Such qualifiers merely secure one result: it just encourages a mad rush to seize a higher moral ground. There is no higher moral ground when it comes to the “warrior” tribe. In today’s world, all of us have views. All of us hang it out — in print media or electronic media or blogs, like this one. We are all “keyboard warriors”. There are, in my view, no “keyboard saints”. In recent days, there are a few blogs/individuals that have rushed to claim that higher moral ground. An outing of such blogs would serve no purpose other than seeking a futile, needless and immaterial date with vituperative and obnoxious polemical responses! A sports fan on a blog (or a writer in print media) expresses views. Indeed all fans (writers) express their views. None of the sports fans (or writers) played in the game that is being commented on. Yet, some of the recently crowned “Saints” have gone on to then say “How dare you question the intelligence of Dhoni? You are not out there in the middle, are you? The guy in the middle makes the decisions. Have you even played the game? How dare you ask the captain to be accountable for tactical decisions that he makes? Does their past record not count for anything at all? Have you forgotten the World Cup win already?”. Yet, we all admit views. We have views. We express them. A rush to claim a higher moral ground is a puerile exercise in futility. And this is because every view carries an irrefutable subjective element in it. Yet, we have a distinction that has been drawn between “Warriors” and “Saints”. Maybe the key differentiator is “over the top”, which then needs to be defined, at the very least. Perhaps this is what Subhash Jayaraman calls “outrage bandwagon”. In the aftermath of Dominica, a view that has been expressed by the “Saints” is that the “Warriors” have brought into sharp question the ability and/or the collective intelligence of the Team India playing group and, particularly so, the Team India captain. I can consider several examples from the past, where the current members of the “Keyboard Saints” club have criticized a player or a set of players. And I am not going to provide a blow-by-blow outing of these instances. As I said before, such an exercise will be needlessly polemic and would not serve any real purpose either in providing a deeper understanding or in furthering the current debate. But let us take one example. Dileep Premchandran, the originator of the excellently graphic “Keyboard Warrior” collective noun (I believe), has expressed his views too: on many topics, games and players. Let us take one specific example merely for purposes of illustration: In this article, the author sketches (in a very compelling manner) the reasons for India’s poor showing in the October 2009 Champions Trophy. In his opinion, Ishant Sharma and RP Singh bowled “hit-me dross, both with new ball and old”. Now, that is an opinion. His opinion. It is likely that it is a valid/correct opinion. However, was he at the ground, playing the match? Has he ever played? Can he even bowl a decent ball, leave alone a non-dross ball? Is he not bringing into question the widely applauded capabilities of Ishant Sharma and RP Singh? After all, the same bowlers delivered impressive wins just prior to delivering “hit-me dross” on that day/match. Had he forgotten that Perth spell when he wrote what he did? Is he, therefore, a “keyboard warrior” who questioned, through his words, the inclusion of RP Singh and Ishant Sharma? More importantly, was it “over the top”? And if it was, who judges it? You? Me? Dileep himself? I can pick similar examples of views and opinions expressed by members of the current members of the “Keyboard Saints” club. But as I said earlier, that would be wholly unnecessary. I have made the point I wish to make on the basis of the above example. Moreover, this is not intended as an “Us vs Them” debate. Disclaimer: I admire Dileep Premachandran as a person. I respect him and what he stands for. I am a great fan of his writing and continually learn from him. The above was not intended to hurt Dileep Premachandran or his “brand”. It was merely used as an example to highlight a point. If I have hurt anyone — especially Dileep Premachandran — by providing the above illustrative example, this would hurt me more than it hurts them/him. I cannot speak for all the “Warriors”. However, when I made the points I made about the draw in Dominica, my intention was not to call into question the collective intelligence of the playing group. I have no way of assessing this. And if I did say I could somehow measure the collective intelligence of the playing group, I would only be gratuitously dishonest (to myself). The “Keyboard Saints” have mounted the argument that the “Keyboard Warriors” have been irreverent to the playing group in questioning the draw-offer decision. After all, goes that “irreverence” line of argument, have you been blind to (a) the impressive set of results that have been delivered lately by these fine players, (b) the fact that we had a second-string team in West Indies, (c) the fact that rain robbed the team of a result in the 2nd Test. I cannot speak for other “Keyboard Warriors”, however, when I made the points I made about the draw in Dominica, I did not ignore either (a), (b), or (c) above. They were just completely irrelevant. I’ll tell you why in a minute. The World-Cup victory did not actually mean much to me! At the risk of being stoned to death by unforgiving Team India fans, let me state again that it would not have mattered to me if India had lost in the quarters or the semis or indeed, the finals [of the World Cup]. For me, it was a small — albeit important — step in a much more important journey. The road ahead for this team is hard and there are significant challenges as Dhoni takes this team from good to great. I am much more interested in seeing how this wonderful leader is going to take Indian cricket along that important journey. I, like other fellow “Keyboard Warriors”, have also fought valiantly for the inclusion of young players and how we need to give them substantial rope. I have argued against employing use-and-discard, revolving-door-policies when it comes to players like Abhinav Mukund, Virat Kohli, M. Vijay, et al. If I ignored all of the above views on Dhoni and the young players in Team India, when I made my comments on the draw-decision, I will have done nothing more than swing wildly from being “a mostly blind, but often one-eyed supporter of Team India” to a “rabid hater of the team”, all in the space of a nano-second! However, I grant that, to the “Current Saints” it may appear that I may have swung on an uncontrollable pendulum. My point is that the irreverence argument is actually irrelevant! There has to be a distinction made between criticism and insult, even if one is labelled by a “Current Saint” as a “Keyboard Warrior”. Criticism is allowed and does not make one a warrior. A personal insult should not be allowed. However, In assessing whether a particular descriptor/adjective/description is an insult or not, we need to respond on whether “bowled hit-me dross” is an accurate descriptor or an insult! At that specific point, when MS Dhoni, the playing group, the coach and others in the team made the decision to offer a draw, the following factors are irrelevant to me and to the draw decision: that India had played with a second-string team, that India will have won the series with a B-team, that India had won the World Cup, that India had beaten Australia in 2008, that India rose to become the number-1 team in Tests, that Dhoni may have worn a blue vest that day, that Harbhajan did not eat an apple that day… at that specific instant in time all of these were, to me, totally irrelevant. India offered a draw because to Team India, on the balance of probability, they either (a) did not see any point in continuing because a win was just completely out of question, (b) they thought that by continuing they only risked losing. I am merely talking about that specific instant in time when the draw decision was offered. At that instant in time, nothing else mattered other than intent. They made the call. The “Warriors” questioned that intent. Not the testicular fortitude, not the abilities, not the capabilities, not the impressive results, not the results achieved with a B-team, not the rain, not the honesty of the individuals involved, not the intelligence nor the eating habits or the clothes that the team was wearing (or not). Nothing else mattered. What mattered to me was intent and nothing else. What was brought into sharp focus at that specific instant in time — everything else being a constant — was just the question of intent, and nothing else but intent… Do the “Warriors” have a right to focus on this “intent”? By focusing on this intent, pray where is the focus on capability, ability or intelligence? Pray where is the focus on B-Team, or World Cup win or #1 in Tests? The “Warriors” saw a perceived lack of intent at that particular instance in time, and questioned it using terms such as “Wimps” or “Gutless” or “Tail between legs” or “Rabbits in Headlights”. Remember only that instant mattered. Would “hit-me dross” be a better term to describe this lack of intent at that specific point in time? My point is that there are no Saints or Warriors; just mad rushes to claim a higher moral ground from time to time. That said, I do accept the proposition that all of this focus has to be carried out without the presence of the “outrage bandwagon”. Wonderful Mohan. A fine dissection. I have thought about this for a while and want to add a few points. 2 One point about the regularly totted out ‘How can you criticise players without having played the game’ – I think it’s pretty clear that the views we’re offering is from the perspective of a watcher. When someone like Sunil Gavaskar criticises a player, he is offering his views from the POV of a legend. When you or me do, we’re doing so as fans. Just as those who read Gavaskar are cognizant of the high perch where he’s sitting, those who read you should be aware of the fact that you’re writing as someone who’s never played first-class cricket. Both views are important. And as long as you’re not cheating your reader of your identity, I can’t see any problem. If the reader wants only Gavaskar’s view, he won’t be reading your blog in the first place. And if he expects you to be deferential to the players simply because you haven’t played competitive cricket, he is kidding himself. 3 The biggest challenge I’ve had while writing about this game is criticizing players for their techniques. If a particular player is out of form, it becomes really hard to criticise him because, as someone who’s never played competitive cricket, I don’t know exactly what he’s doing wrong. It’s at these times that I’ve quoted former players (because I think they’ll get closer to the truth than me) and left the analysis to the former players. 4 Of course the big problem for the former players is to analyse the technique of someone like Tendulkar (who possesses a technique and mindset that is probably well beyond their understanding). Which is precisely why Tendulkar is one of the most under-analysed players in modern cricket and even when he’s out of form, experts prefer to give him the benefit of the doubt. I don’t really blame them – how does one really criticse something one doesn’t understand? I thought of converting this comment into a blogpost but decided to leave it here because it really doesn’t work as a standalone. For it to be complete, it needs the wonderful analysis that you’ve put forth above. @sidvee: Please please do write more on the 4 excellent points you make. They deserve a deeper analysis. The concept of critiquing criticism and critiques is quite interesting and requires an objective analysis from someone who has been (and still is) close to the game; writing of your personal experiences while at CI, especially on the tricky passages when fanboyism needed careful skirting around, would be valuable to everyone, IMO. I can’t appreciate the 3rd point (in Sid’s comment) enough. It’s a point that boggles me all the time. Mukul Kesavan often writes about how an average Indian cricket fan has never really played the game at any reasonable level. There are millions of fans who have never even held a cricket ball in their hands. I never shared his skepticism for such fans, but that point is quite incredible. It’s convenient to sit back in a couch and criticize a player’s technique – X gets too far across, Y can’t even get the ball to hold its line, leave alone getting it to move away etc., I also think it’s important that fans do it. It’s our own way of trying to understand the game more…our little way to show off our theoretical knowledge…we may be wrong…but we are making the effort…we are showing that we care for more than just the runs and wickets. At the same time, I have an internal conflict doing this exercise. Am I trying to become an expert at something that I really don’t have a clue of? Assuming I was a FC cricketer, is my understanding of the game necessarily better? Is there basic level of competence at all or is it all relative? Does RSD understand how Viru works? Can they even relate to each other? Ram Guha’s “For had I been better I would not have had the necessary empathy; had I been much worse I would not have had the necessary understanding” comes the closest to this ‘playing ability vs ability to appreciate’ conundrum. 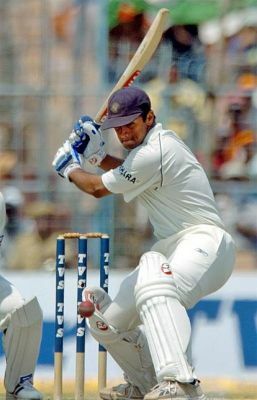 PS: Isn’t it incredible that Sachin is both the most under-analysed as well as the most scrutinized player in the game ever! Fine point re Ram Guha. I remember the line well. I’m glad for the empathy and think a lot of full-time cricket reporters are too immersed in the functioning of the team to fully bring that aspect out. Someone like Guha does that. And I agree that people who haven’t played must still make an attempt to understand and write about players’ techniques. It maybe different from what an ex-player sees but it’s still an important point (as long as the non-player is not grossly off the mark). And it’s only by trying that we’re going to get any closer. So I can’t understand the problem with ‘armchair critics’ as long as they don’t stray into random criticism like ‘players are here only to make money’ and ‘all games are fixed’. That’s just lazy. The rest of the time, I think fans must express their views. They must celebrate the team and they must agonize over the team too. Occasionally they are bound to go over the top (in both praise and criticism) but that’s eventually what fandom boils down to, isn’t it?